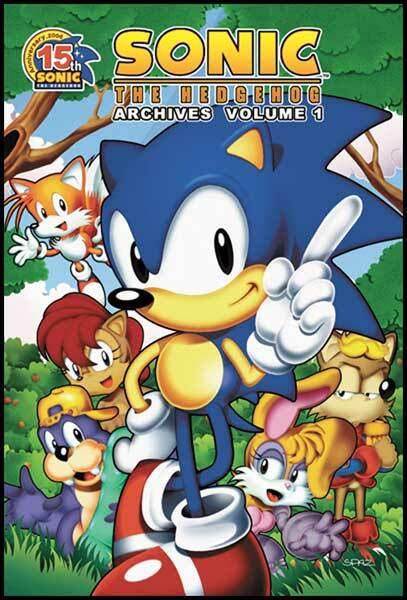 Sonic Archives Volume 1 collects the earliest issues of the Sonic comic. 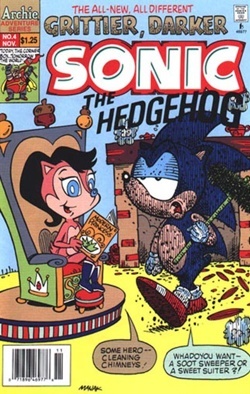 After the success of the initial mini-series (which would be re-released later in Sonic Archives Volume 0), Archie began the standard release of the Sonic comics. 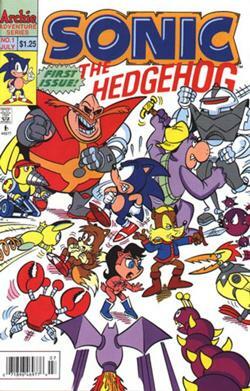 Issues #1 through #4 are collected here, and feature the first instances many of us see the Freedom Fighters, the group of heroes dedicated to stopping Dr. Robotnik. This volume is also the only volume to date that does not contain any extra content at the end of the volume. 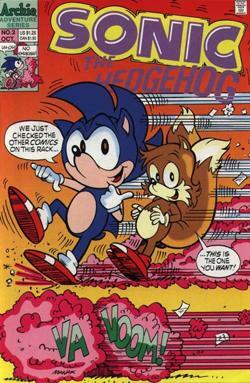 The very first story of the entire comic series introduces Sonic and the Freedom Fighters: Sally Acorn, the princess and leader of the group, Tails, the young two-tailed fox who idolizes Sonic, Antoine D’Coolette, a cowardly yet intelligent coyote, and Rotor, a mechanic and handyman for the group. 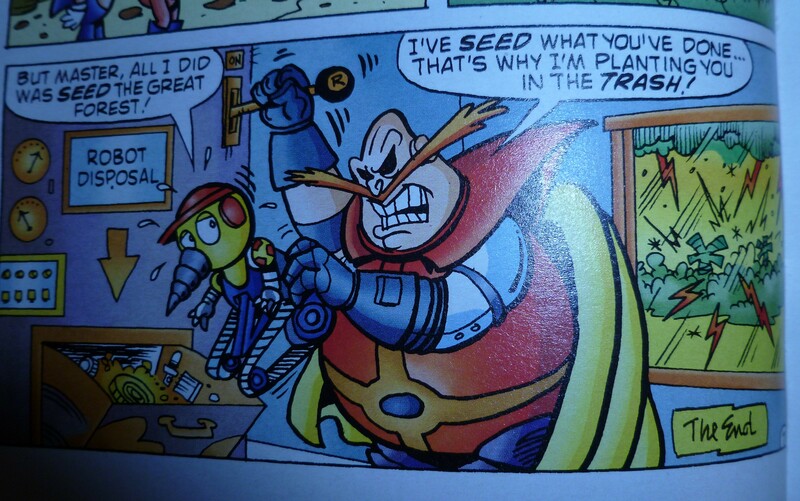 Robotnik has created a mechanical plant that can devour the Great Forest, home of the Freedom Fighters’ secret hideout of Knothole Village, and it is spreading fast. 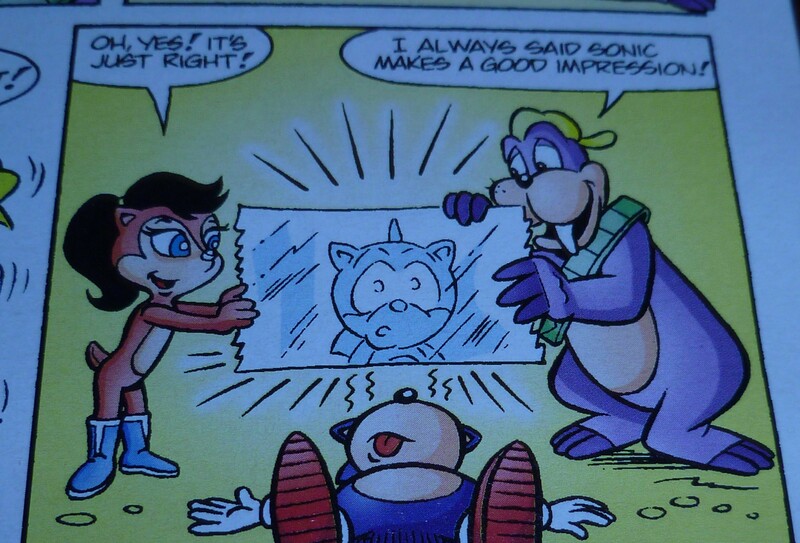 Sonic and crew investigate the issue. Sonic is a bit bored lately with nothing to do, but when word of a new casino being opened in the Casino Night Zone, inspired by the level is Sonic 2 for the Genesis, the hedgehog jumps on the idea of action. Robotnik eventually captures Sonic and uses him as a pinball in a game (but don’t get ahead of yourself, the Sonic Spinball volume is coming up shortly). A few Sonic Spins later and Robotnik’s plans are foiled again. – Though this is the first instance of the Walrus and Freedom Fighter Rotor, he is referred to as Boomer. 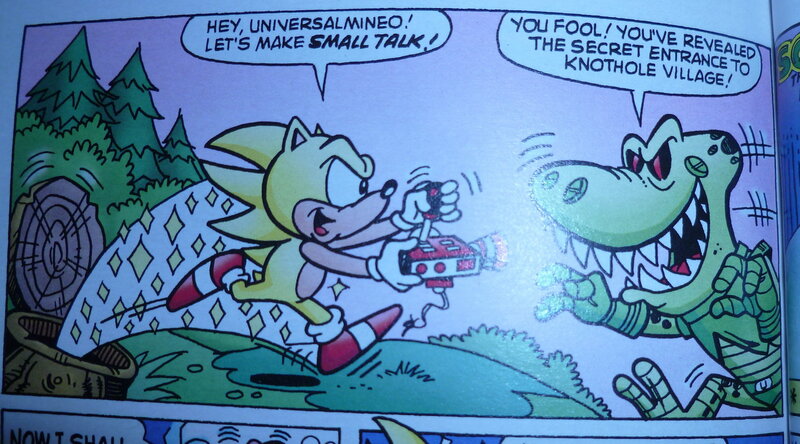 It isn’t until Sonic Archives Volume 2 that he is called his correct name of Rotor. – Sally has pink fur, black hair, and does not wear a vest. She would add her signature vest later in the series, as well as change colors to brown furred and brown haired. Robotnik sends three new robots after Sonic and the Freedom Fighters: Coconuts, a monkey which explosive coconut bombs, Scratch, a dimwitted chicken-like robot, and Grounder, a burrobot-like robot with drill hands. Sonic gets transported to the Special Zone while out collecting rings. The zone is a strange with, with Horizont-Al and Verti-Cal guiding Sonic through his topsy-turvy adventure. – First appearances of Coconuts, Scratch, and Grounder. – First appearances of Horizont-Al and Verti-Cal, the crazy duo that guide Sonic through the Special Zone. 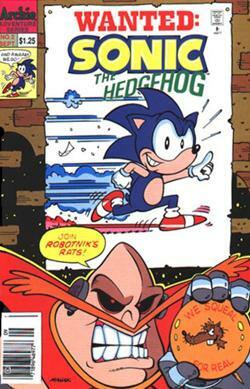 Sonic overhears Robotnik talking about a bomb. The Freedom Fighters decide to protest the bomb, as it will likely destroy the entire Great Forest. 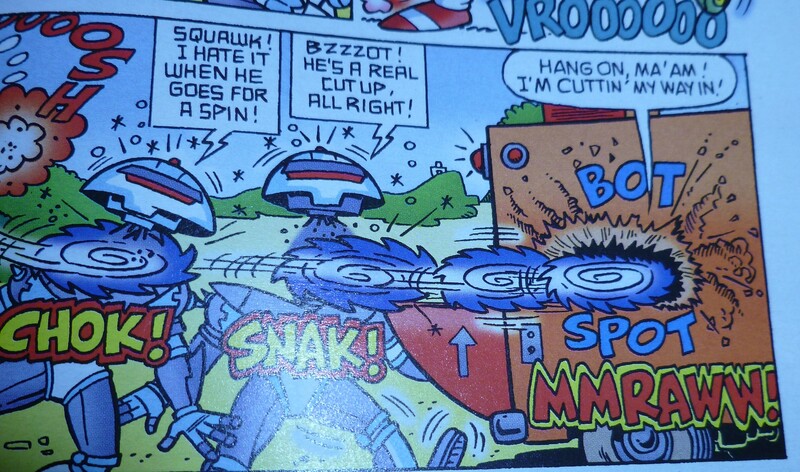 Rotor and Sonic notice a rabbit being assaulted by a team of SWAT Bots. They attempt to turn her into a robot there on the spot, but Sonic stops them halfway through the process, leaving the rabbit half-animal, half-robot. To make things worse, a giant Burrobot is destroying the Great Forest! – In one of the issues bonus pages, Sally is upset at a newspaper headline stating, “Sally’s Blonde to Brunette Debacle.” This is a reference to Sally originally having yellow hair in the very first Sonic mini-series that was released as a pilot before this series launched. Robotnik is up to no good yet again, swearing that the next animal that is captured is going to be turned into a truly formidable foe for the Freedom Fighters. To his dismay, the newest captured animal is a tiny salamander. After a lab mishap however, the salamander is transformed to gargantuan proportions and becomes the Universalamander. Tails’ first solo outing has him protecting the Great Forest and all of planet Mobius while Sonic takes a nap. After defeating some of Robotnik’s baddies, Tails gets a hothead and goes directly to Robotropolis to defeat Dr. Robotnik once and for all. – Sonic states he earlier collected enough rings and the seven Chaos Emeralds, referencing the events of Sonic 2. – Sonic becomes Super Sonic for the first time. Sonic Archives Volume 1 is a very crude introduction for what is to come. These stories as well as a the next handful are one-shot deals; they tell you one story that has light drama and a lot of humor, and that’s it. I do enjoy the periodical continuity between comics (this isn’t the last time we will see the Universalamander, for example), and the lightheartedness makes for a great monthly comic series. However, more recent issues deal with much greater issues than a plant destroying the Great Forest, and when the series gets into real problems like the destruction of Knothole Village, or the injuring of innocent animals, things start to get a lot more serious and, in a way, a lot more entertaining.